Thinking outside of the box is a “must” when trying to get someone’s attention. The trouble is, few of us know what that looks like or how to do it. Three years ago, Ian Greenleigh decided that if employers used ads to find job seekers, then maybe job seekers could use ads to find a new employer. Several ad campaigns (Facebook, Google & LinkedIn) and one book deal later, Ian is the go-to expert on using ads to find work. The story begins in 2010. While Ian worked various sales jobs, he was also applying for marketing positions, without success. 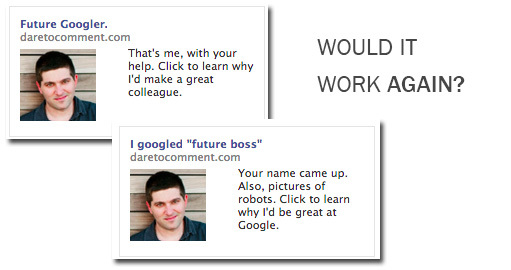 While searching for a job, he happened to read about a guy who found work with a Facebook ad. Using about $150 in Facebook ads, Ian targeted marketing managers in his area. Quickly, his weekly job rejections turned into interviews, including one with his dream employer–Bazaarvoice. His dream job interview produced a job offer and Ian has been managing social media and content strategy at Bazaarvoice ever since. In addition to landing his dream job, Ian’s success received press attention and landed him a book contract. As part of the research for his book, Ian tested ads in February by posing as a job candidate to see if he could get the attention of Google employees. His two Facebook ads reached 6,947 Googlers, received 48 clicks (0.103% CTR), at a total cost of $30.68. Since Ian has a job he loves, we will never know what might have happened with his new friends at Google, but it’s pretty impressive that he could get their attention. Building on his success with Facebook ads and Google, Ian experimented most recently with LinkedIn. A snazzy writer with a great story, his goal was to reach the Executive Editor at LinkedIn and become a dedicated LinkedIn blogger. Instead of just trying to reach him directly, Ian also mounted a campaign to have other LinkedIn employees contact the editor on his behalf. This strategy succeeded, and he got a phone call from the editor, who said the campaign had created internal buzz that was impossible to ignore. They are discussing a possible contributor role in the future, but nothing is cemented. So what does this all mean? Three years ago, when Ian had his first success, he thought the idea of using ads to find work would take off and the market would be oversaturated by now, leading to diminishing returns on this technique. Alternatively, he thought that this use of ads on social sites might be monetized, productized, and sold to job seekers at much higher rates. Neither has happened. *Go outside of your comfort zone to get results. Take a chance on a new approach—something totally unlike anything you’ve done before. *Target well. In all three cases, Ian targeted people in certain roles or workplaces (marketing executives, Google and LinkedIn employees). But don’t be too narrow either. Target people in a specific role in your top-pick company and also target a cluster of roles (marketing, promotion, social media, PR) across several companies. Analyze the data you get back to continuously optimize your ads. Intuition is often misleading when it comes to guessing which ads will work. *Make the call to action very clear—what do you want the person who sees the ad to do? Click to see your portfolio? Introduce you to a specific colleague? Then spell it out and don’t make them guess! *Get a good headshot and smile. People respond to human faces in advertising. *Don’t be a one-click pony. The ad is just a vehicle—it gets people to The Embassy of You, where the real consideration happens. Make sure whatever comes after the click demonstrates your ingenuity, just like the ad. Ian mentions the hire-me campaign mounted by Lindsay Blackwell as an example of a fully-integrated job search. Perhaps the best way to sum up the use of online ads to find work is that it helps you (the job candidate) stand out from the crowd at a time when the market is overpopulated with job seekers. Creative use of social networks can also help people overcome their competitive weaknesses. Ian received several calls from his first ad despite his on-paper marketing experience being pretty thin. He directly demonstrated his skills to the hiring managers, moving him out of the pile and on to their radar. 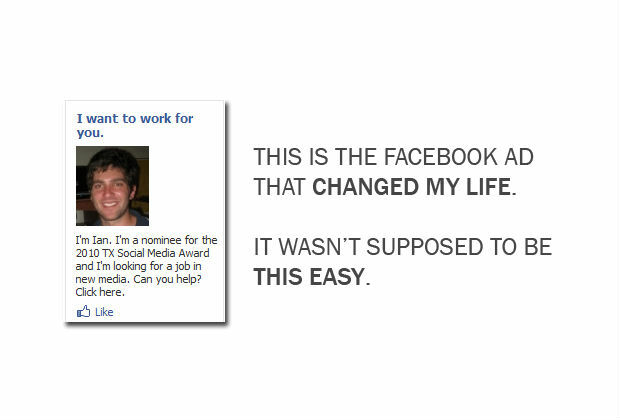 Click here to read about social media from a recruiter’s perspective. LinkedIn is another great place to network– check out how Jeff Zelaya became an expert!